OK, quick let’s play a round of try of Tri-Bond. It’s the game where you list 3 things and then name what they have in common. So here goes, what do a boy, a prostitute, and a murderer all have in common? The answer, they were all used by God to do godly things for the Lord. This post is for me, more than anybody.. Sometimes I have the habit of being very judgmental. Sometimes it’s on myself and sometimes it’s aimed at others. If you take some time and thumb through your Bible you will see quite a wide list of people who God choose to use to accomplish His will. 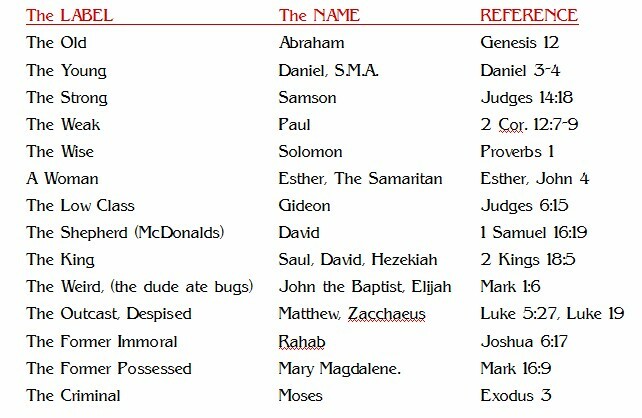 Below is a short summary of a few of the different kind of people who choose to use and the scriptures where you can read about them. Each of these people had 2 things in common. 1.) They had to learn to let go of their past in order to move forward into what God had asked them to accomplish. 2.) They had to obey God and do what he asked them to do with what resources they had. Yes, some of them questioned God and wanted to run away from it at first, but they all eventually let go of their past and obeyed God’s desire for their life. This is really a 2-sided coin, or rather 2 ways you can look at it. Sometimes you might not feel like you are not the right person for the job or that you are incapable of doing what you know God has put on your heart, stop listening to the lies of Satan and take a lesson from the many pages of the Bible where God used ordinary, plain, average people to accomplish his will. I love the scripture “When they saw the courage of Peter and John and realized that they were unschooled, ordinary men, they were astonished and they took note that these men had been with Jesus.” Acts 4:13. Give me hope for myself. On the flip side of the coin, you have to be careful that you don’t make judgments based on the outward appearance or past of people. God can change people in an instant and with God’s help He can motivate ANYBODY into new areas leadership or accomplishments. The old saying “Don’t judge a book by its cover” comes to mind. Also be like this little boy who didn’t have much, but he was willing to give it to Jesus to help or be part of the solution. That’s what God wants from us, only what we have, and not any more. Are you willing to give up all you have to let God do something great with it? Will you be like Moses (a murderer) or Rahab (a prostitute) and let go of your past and do what God has called you to do and let him use you to accomplish something great? This entry was posted on Thursday, February 25th, 2010 at 10:22 am and is filed under Leadership, Religous and Life, Student Ministry. You can follow any responses to this entry through the RSS 2.0 feed. You can leave a response, or trackback from your own site.